A background as to why am I writing a post on Anaemia. I have worked with 2 members of FOGSI in 2008-09 Dr.Usha Valadra and Dr.Sanjay Shah in association with Emcure Pharma and conducted Lectures on Anaemia Awareness in Lourdes Convent School and Lancer's Army School & SNDT Commerce College - in Surat. I liked the concept and now when I am back to Surat for few days I thought of taking this concept forward and taking camps across as many Schools and Colleges as possible. Let us start with the very very basic facts. 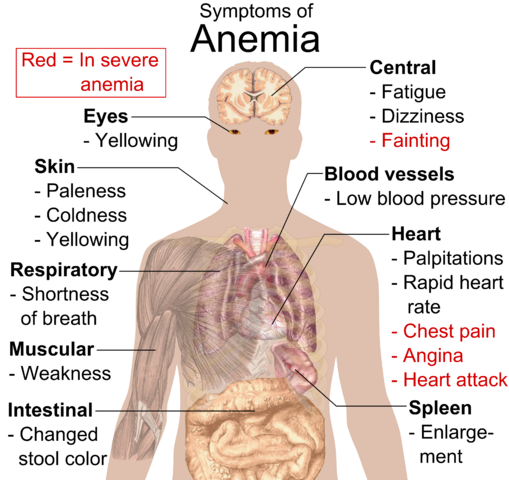 Anaemia in common understandable language is : Disease caused due to Iron Deficiency. This may vary in different age groups and conditions like Puberty, Pregnancy and Lactation. 1) Blood loss due to Excessive bleeding, Ulcers, Haemorrhage, Bleeding during delivery, frequent Blood Donation etc. 2) Defeciency of Iron during accelerated growth phase – Infancy, Adolescence, Pregnancy, Lactation etc. 4) Iron poor diet in Infants, Children, Teens and Vegetarians. 5) Certain Drugs, Foods, Caffeinated drinks etc. There can be many other or lesser symptoms but it all depends on causes of Anaemia because Anaemia is not just caused because of Iron defeciency. The severity of the symptoms depends on the speed at which Anaemia develops in your body. Fact No 1: Breast-milk contains less iron-content but has better absorption and digestibility than other milks. Cereals: Bajra, Jowar, Rice flakes (Poha), Rice puffed (Mamra), Vermicelli (Sevai), Broken wheat(Dalia), Ragi (Nachni) etc. Pulses: Soyabean, Masur, Math, Udad(Black gram dal) , Mung (Green gram dal), Chanadal, Desi chana (Horse gram), Kabuli chana, Rajma (Kidney Beans) Roasted chana (Daadiya), Chawli, Drypeas, Cowpea – almost all pulses are rich in Iron, etc. Vegetables: Ajwain ke patte(Omum leaves) , Arbi ke patte (Colocasia Leaves), Sarson ke patte(Mustard leaves), Pudina(Mint Leaves), Muli bhaji(Radish leaves), Pyaz bhaji (Spring onion leaves), Cauliflower leaves, Raw banana (Plaintain green), Soya bhaji (Soyabean leaves), Shaljam ke patte(Turnip greens), Broccoli, Beetroot greens (Almost all green leafy vegetables are rich in Iron), etc. Nuts, Dry fruits & Oilseeds: Dry coconut, Black & White Til(Sesame seeds), Pista (Pistachio), Charoli/Chiraunji , Groundnut, Niger seeds, Pumpkin seeds (roasted) , Almonds, Dried Dates, etc. Fruits: Apple, Strawberry, Water-melon, Pomegranate – to some extent etc. Amla(Gooseberry), Lemon, Orange, Sweet-lime, Pineapple, Guava, Cherries, Water-melon, Kiwi-fruit, Lichi, Cabbage, Drumstick, Mint leaves, Coriander leaves etc. 1) Using excess of antacids: eg: Gelusil, Eno, Digene etc. Good Day & Good Luck for Better Iron Levels! 2)did green leafy vegetables retain its property if cooked in any other kadai other then iron? Ans No 1) Tea/ Coffee should never be had on an empty stomach. It should always be taken after a gap of at least 20-30 minutes after a meal. This way the Tannin in Tea and Caffeine in Coffee it doesn't interfere with the absorption of Minerals present in the food. And No 2) By green leafy vegetables I meant Bhaajis like Palak Methi etc. If these veggies are cooked in Iron Kadhai they become all the more a better source of Iron (altough the Iron content of Kadhai is transferred only in minute amount eg: 0.00051gm ). Alluminium does not have any effect in betterment of nutritional value on the contrary excess use of Alluminium is found to be unhealthy.